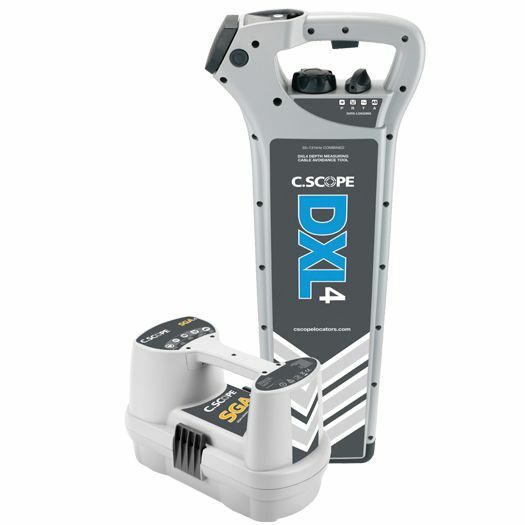 The new DXL4 Cable Avoidance Tool and SGV4/SGA4 Signal Generator from C.Scope is the latest equipment for detection of buried utilities prior any form of excavation. The XL4 updated cable avoidance tool series are loaded with latest features to find more buried metallic utilities by delivering significantly improved levels of performance and helping to reduce the effects of human error. 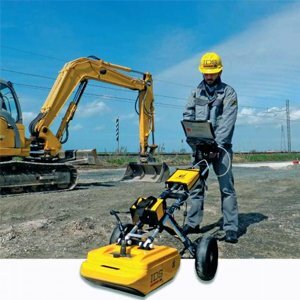 When used in conjunction with the SGA4/SGV4 Signal Generator the equipment becomes a versatile locator for Deeper and Harder to Detect Pipes and Cables for Complex Locate Tasks. 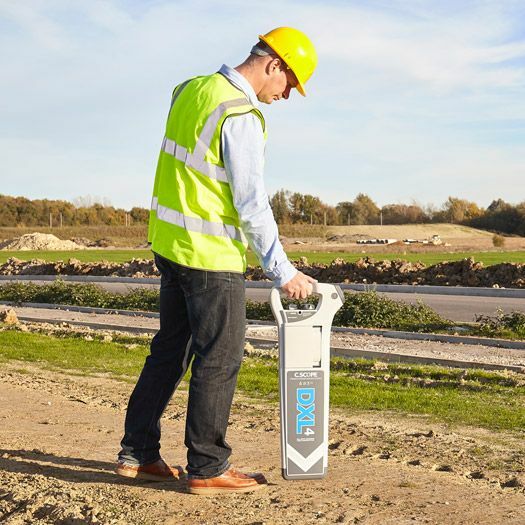 The Dual 33+131kHz Combined frequency will assist in the detection of smaller buried cables such as Telecoms, sheathed fiber optics and street lighting spurs. 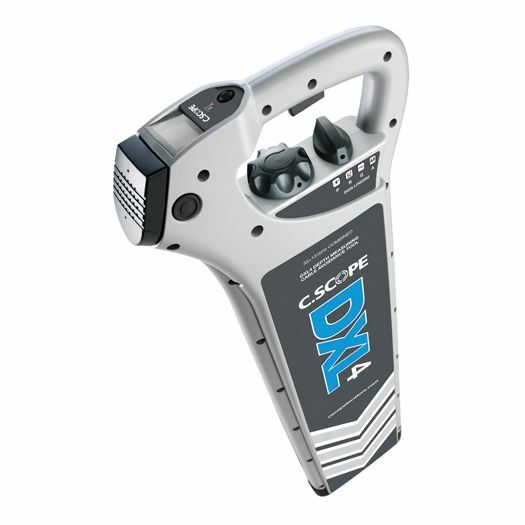 The XL4 Cable Avoidance Tools are driven by powerful digital signal processor technology, advanced software programming and deliver improved signal detection sensitivity” and Automatic Noise Rejection to detect smallest of signals even when locating in the most difficult areas of high service density and electrical noise. 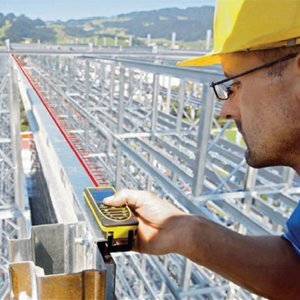 Intelligent features such as an Automatic Daily Self-Test function, Alarm for shallow cables detected and a Dynamic Swing Sensor help ensure that the best working practices are adhered to and are being applied on-site. The Data Logging feature now included as standard provides an invaluable insight into when and how the tool was utilized by the operator and helps to identify key training requirements. 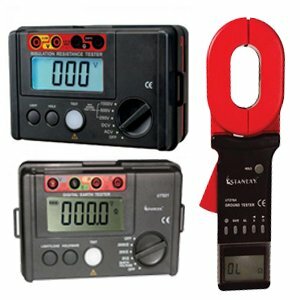 Stanlay C.Scope cable locators are the most rugged equipment in the industry - water proof, dust proof, impact rated with IP65 environmental rating ensuring long product life. The equipment is fully digital and does not require recalibration. The DXL4 Cable Avoidance Tool provides the best return on investment. Built to last. Radio Mode :Detects re-radiated ‘radio’ type signals that are often present on metal pipes & cables. Generator Mode : is used to detect the 33+131khz signal applied to a metallic pipe or cable by SGV4 signal generator and is also used for detecting the signal from a C.Scope sonde or Stanlay traceable duct rodder when tracing in non metallic pipe such as sewers, drains or telecom cable ducts. * Confirmation of selected mode. * Depth (in T Mode & when selected). SENSITIVITY CONTROL : to ensure very precise locating. DETACHABLE LOUDSPEAKER : to allow operation of instrument in noisy environments. 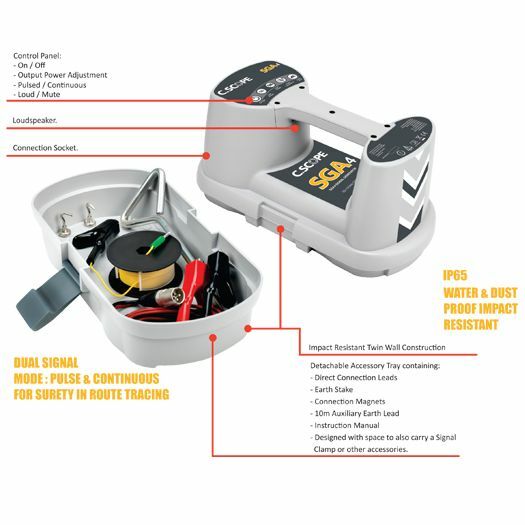 BUILT in DUAL BATTERY PACK : Battery Compartment Contains the USB Socket allowing the user to print out a system validation certificate when required. DATA LOGGING: The DLX4 and CXL4 have full data logging capability. This can be conveniently transferred at any time for analysis. DATA LOG TRANSFER VIA USB:Data from the Data Logging versions of the CXL4 and DXL4 can be transferred at any time to a PC for analysis, all XL4 locating receiver have USB data connection socket. DATA LOG TRANSFER VIA BLUETOOTHTM:The DXL4 DBG model has the additional features of Bluetooth to download data wirelessly onto C.Scope relay Smart Phone App installed on any android Smart Phone. DATA LOG TRANSFER VIA GPS:In- built GPS models also allow a record to be kept of exactly where the Cable Avoidance Tools have been used that can then be viewed in partnership with Google EarthTM or Google MapTM. 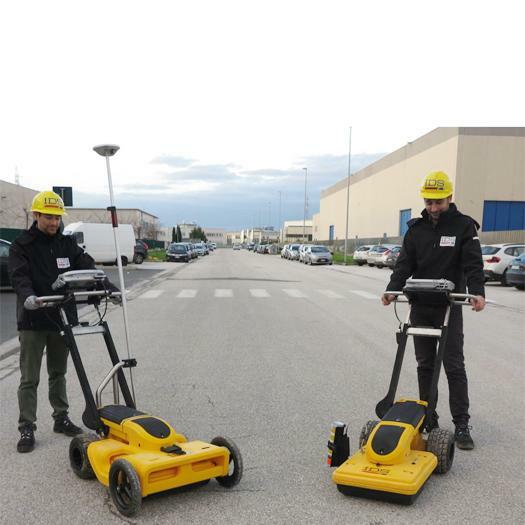 Additionally, the Cable Avoidance Tool may be paired to third-party GPS survey equipment, via the locators in-built BluetoothTM facilitating ‘one-pass’ underground utility surveys to be undertaken. 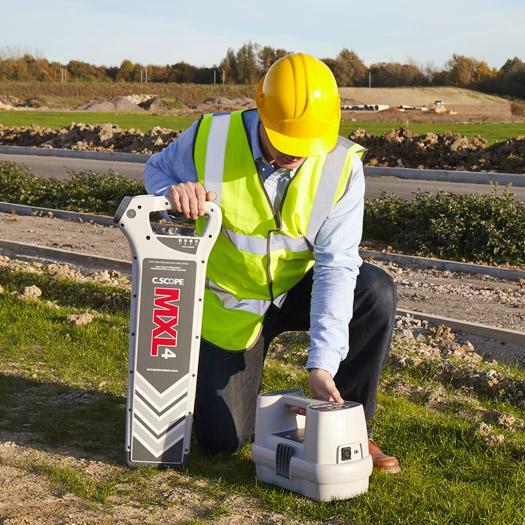 DIRECT CONNECTION: allows specific pipes or cables to be individually traced, identified and their depths measured. 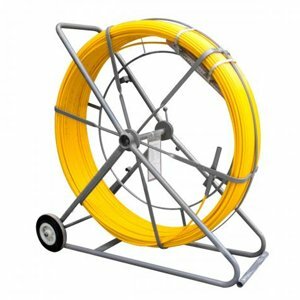 The use of Signal Clamps, Signal Injectors and Direct Connection leads make this mode the most effective method for pinpointing pipes and cables. INDUCTIVE SIGNAL CLAMP (OPTIONAL): If it is difficult or inconvenient to use Direct Connection, then the signal clamp can be utilized to successfully energize an armored optical fiber cable, street lighting cable etc. INDUCTION: allows the Signal Generator to induce a detectable and traceable signal to previously unknown, undetected or inaccessible underground metal pipes or cables without any direct connection. This is also referred to as a Blind Search and significantly increases capability to locate or trace buried services. 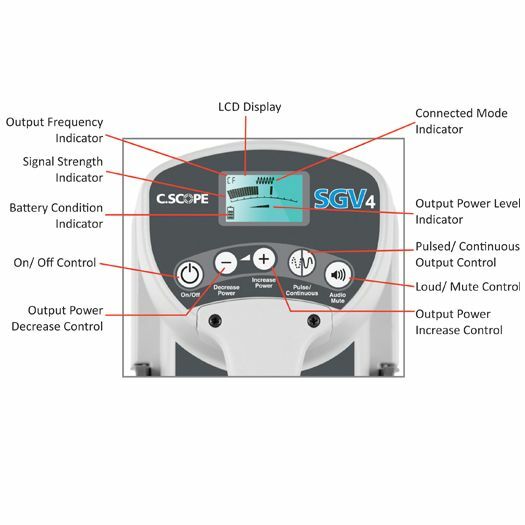 POWER OUTPUT: The SGV4 has a four position power level adjustment & SGA4 has a two level power output, so that the user can control how much power to use and when. LOUDSPEAKER: The SGV/A4 has a clear audible signal output to indicate when it is in operation. There is also the facility to mute the audio if required. PULSED OR CONTINUOUS SIGNAL OUTPUT: The SGV4 offer the choice of a Pulsed or Continuous signal output enabling operators to switch to the Pulsed Mode in high interference situations and keep on tracing. LCD CLEAR DIGITAL DISPLAY: The SGV4 has a large, clear and easy-to-read backlit LCD mounted behind a tough protective polycarbonate lens. The display indicates clear information about the functions selected, the power level being used and battery condition. ROBUST & DURABLE CONSTRUCTION: The SGV4’s twin wall construction is robust and durable. It also provides IP65 standard protection against dust and water ingress. DATA LOGGING: The SGV4 Signal Generator will automatically record and store how when and for how long the instrument has been operated, Twelve months of data can be stored before being overwritten. It is therefore possible to keep a full audit trail of the activity of the signal generator and its functionality. Data can be transferred to a PC using USB socket built in the signal generator. AUTOMATIC DAILY SELF TEST (Available on SGV4): The signal generator will undertake automatic daily self test and prior first use of every single day of operation and will provide Pass / Fail Indication on the LCD display.